In order to undertake EPAs, EPAOs need to support each element of the EPA Value Chain. The Value Chain illustrates the value-adding activities, both direct (chevrons) and supporting. Quartz is the only system which supports all of the key EPA Value Chain elements. Quartz's offers both on-line entry of registrations, and a huge range of file-formats options for bulk uploading of registrations. Quartz is designed to record each person (learner, apprentice, or contact) once and only once. Quartz uses a fuzzy-logic matching algorithm to minimise duplication, maintaining a consistent timeline of achievement and assessment. The gateway element of apprenticeships is designed to ensure that apprentices are ready for their EPA. 'Readiness Confirmation' includes any other preparatory tasks which the EPAO needs to complete before scheduling the EPA. This is a critical value-added task: adding value for your customers, but also for your IAs. 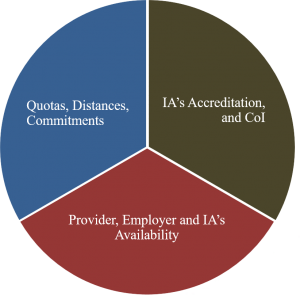 IA Scheduling is the task of identifying and securing appropriate IA resources taking into account a complex set of time, location and resource constraints. Assessments are recorded using QuartzWeb 'direct entry'. This includes save-and-continue preliminary assessment recording and a fully-workflow-enabled, and fully on-line enabled submission and verification process. Quartz workflow is used to manage contracts with IAs. This provides for a preparation phase, authoisation phase, statuses, and values for maximum travel distance and quota, which are used by the IA Scheduling. The contract workflow document library provides (inter alia) a version-controlled source for draft and final contract documents.